At Arbor Teas, the daily mission is to find the world’s most fantastic organic teas and deliver them to customers as sustainably as possible. From the exceptional collection of organic and Fair Trade Certified® teas, to the company’s ten-year commitment to Carbonfree® business practices, and use of backyard compostable packaging, Arbor Teas’ passion is steeped in a desire to do worldly good and maintain the company vision to remain organic to a tea™. Any tea devotee knows that not all teas are created equal. Arbor Teas performs extensive comparative tasting whenever they consider adding a new tea to their catalog. The staff meticulously manages inventory of teas and stores them in temperature controlled “cold” rooms, to maintain maximum freshness, in order to offer only the best organic and Fair Trade Certified® teas and herbs in the world. Arbor Teas inventory is selected with quality, organic certification, and Fair Trade certification in mind. First and foremost, the team searches for organic certified teas that represent classic manufacturing styles from around the world, then select the best organic variety within each style. If they find a tea that is of high quality, organic certified, and Fair Trade Certified®, that product is selected first. As part of its ongoing sustainability initiatives, Arbor Teas installed a solar array in the spring, using SolarWorld panels fabricated in the USA. It is a 6.5 kwh facility that was sized to supply all the electricity for Arbor Teas offices, production area and warehousing. The majority of Arbor Teas are sourced from overseas and transported by sea freight, which is the most energy-efficient method of transportation. Domestic herbs are transported by truck (not plane). Air-transit generates far greater greenhouse gas emissions than ground transportation. Arbor Teas’ innovative backyard compostable packaging uses a cellulose film derived from wood pulp sourced from sustainably managed trees. The thin, lightweight material allows it to break down quickly (even in home compost heaps! ), and adds practically no weight during shipping. 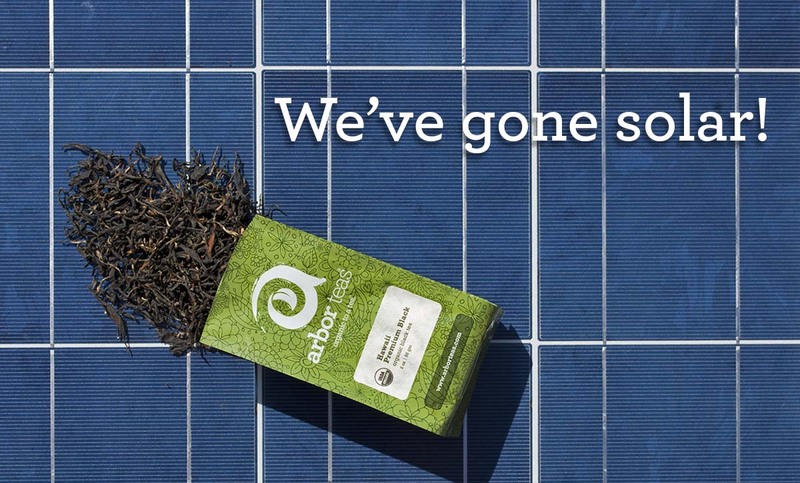 To ensure that any remaining product shipping and operational emissions are neutralized, Arbor Teas relies on its ten-year partnership with Carbonfund.org to offset the remaining carbon emissions through green energy, energy efficiency, and reforestation projects. To date, Arbor Teas has mitigated the greenhouse gases impact of over 900,000 pounds of carbon emissions, which is comparable to planting almost 11,000 tree seedlings then growing those trees for ten years! Carbonfund.org is pleased to continue our partnership with Arbor Teas and to help achieve their mission to remain organic to a tea™.